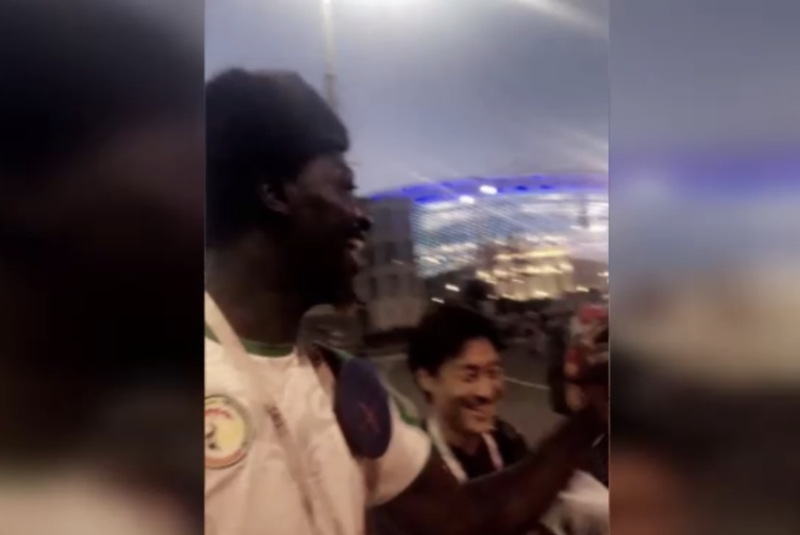 World Cup fans can be a competitive bunch, but there was no animosity on display between a group from Japan and a man from Senegal after their teams faced off in a World Cup match. Senegal and Japan drew 2-2 on Sunday. And after the tie, a few fans from the opposing teams shared a moment of celebration together. John Sulo captured the moment when he and a few Japan fans bonded after the soccer match. The group boisterously sang together was they walked away from the stadium. Sulo is from Senegal and speaks French; his Twitter bio says he lives in the U.K. The caption to the video was written in French on Twitter. "Best time of the day: singing 'One Piece' music with the Japanese after the match," the caption translates to. "One Piece" is a Japanese anime show. The group was apparently singing a song from the cartoon in Japanese, and Sulo must be a fan, because he knew every word in Japanese. Sulo's video of the enthusiastic cross-cultural sing-along got over 1 million views in just one day. It was a vision of soccer bringing people together. Despite the language barrier and the fact that they supported rival teams, the Japan and Senegal fans found something to bond over, proving that sometimes good sportsmanship is stronger than competitiveness.